This year's Wonderwool was extra special, because I got to share it with a lot of very lovely people. The Knatterers had a weekend in a bunkhouse and attended the show on two days. This was the view from my bed: sheep and pigs and hills and blue skies. I've never enjoyed getting up before 7am so much - in fact, it heralded the beginning of the new habit I mentioned last week. Going for two days meant there was less of the must-buy-now-because-we're-leaving-soon purchases. I'd like to say I bought less overall, but I don't think that would be entirely truthful. PSYCHE! It's not all mine....this is the haul among the eight of us, after the Saturday. 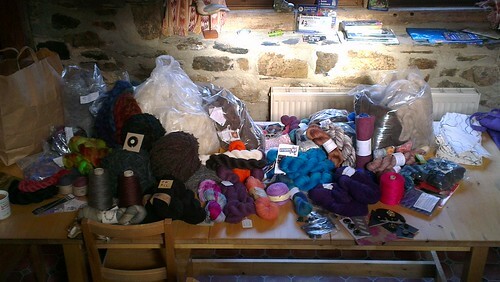 Most of the bulk is fibre and April's massive tweedy balls (tm). Here's my slightly more restrained stash addition. Now for the Tuesday Ten: my purchases. 1. Five skeins of Easyknits Deeply Wicked DK in a beautiful shade of turquoise that I just can't capture on camera. My very first purchase: I knew I would be sorry if it had gone when I returned. This will be a jumper with a big collar, I have decided. 2. Two skeins of fivemoons angora blend 4 ply. This was an impulse purchase at the end of Sunday. I found it very busy on the Saturday - to me it felt busier than last year although nobody else seemed to think so - and I completely missed this stall until I was walking back to where we were sitting, having collected my goodies from the Scotch egg man. There were four skeins marked down. I bought two and dreamed of knee socks. When I got home I realised that almost nobody knits angora socks, so I went online and bought the other two skeins. I'm not even sorry. I have picked out a pattern for a cabled cape. Bunny cape! Will this make me Superbun? 3. One skein of plain sock yarn. I have forgotten where I got it: somewhere selling plain yarn and dyes. 4. Two skeins of Artisan linen/silk laceweight. I walked away from this at the end of the day on Saturday and made myself think about it overnight. I think it will be a tunic top I picked out of Interweave a few years ago. 5. One of the 10 skeins of Laalbear BFL worsted. I have fond memories of a brown v neck jumper that belonged to my uni housemate's mum, which I borrowed a few times and hoped to hang onto permanently. Now seems like a good time to have a go at recreating. The lady on the stall packed this tightly into a sealed bag for me and told me to smell it when I opened it up. April and I enjoyed that when we got back to the bunkhouse. Sheepy! 6. A ball of Jawoll Magic Degrade. Having crocheted a cowl out of this I then decided it would be perfect for a pair of colourwork socks, the pattern for which is in the new sock book I bought at Wonderwool. It will go along nicely with number 3. 7. A cone of pink Texere linen 4 ply. An utter bargain - I think it was £6; I am nearly halfway through the camisole pattern I picked for it and it barely looks used yet. It is pretty rough to knit with but there's a lot of talk of it softening up considerably when washed/ironed. 8. Two skeins of Bigwigs angora/merino blend. I couldn't resist. I want to knit a scarf out of it to replace the red angora scarf Mother Hand bought me when I had my tonsils out, which I wore until ti resembled a scraggly bootlace. The lady also let me pet her wool bunny which made me wishfully consider my only wool bunny ranch. It would have to have alpacas too, though. 9. At the front, a skein of silk. I don't know much more about it than that; it came from Wingham's. The colour got me. I have no idea what I am going to make with it. 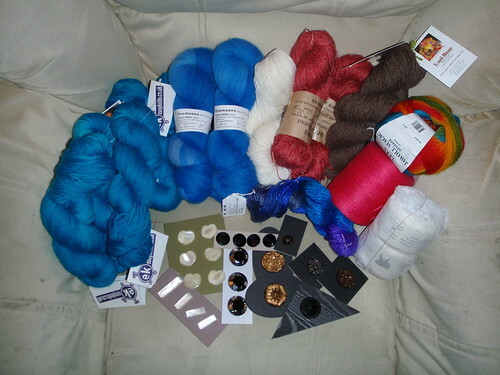 I felt very pleased with my purchases and not at all disappointed that Knitwitches didn't have the three skeins of cashmere silk 4 ply I had been saving up for. I am absolutely insistent that it will all (mostly) (partially) be knitted up before next year though. Number 10 is all the buttons. Naturally I spent the largest amount of time at the button stall, happily seated in a deckchair, looking through the box of vintage glass I had asked to see. "I hope you don't mind if I just take a look at this one," said a random woman as she reached over and hoiked one out. She nearly lost her hand. There's a definite deco vibe to this year's purchases. I love the angled MoP ones and the one with the cube thing on reminds me of a Fascist symbol of some kind, though it is purportedly Victorian and therefore predates all that nonsense. 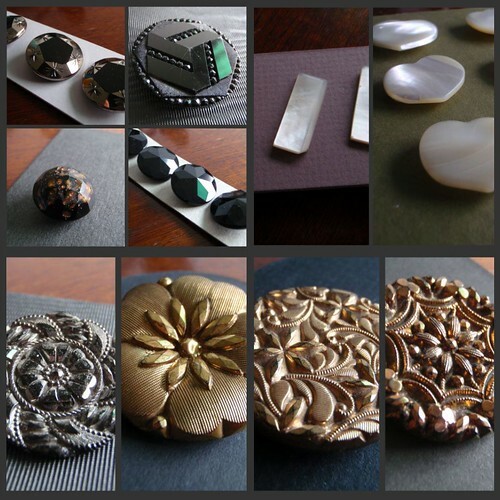 The ones in the top left are mirrored; the one below is a smaller version of one I bought last year; I intend to put three of the four along the bottom on the same garment - bronze, silver, gold. Not the big flower, that will go somewhere else. It was a truly lovely, relaxing weekend. We laughed a lot and knitted a lot, with some spinning in there. 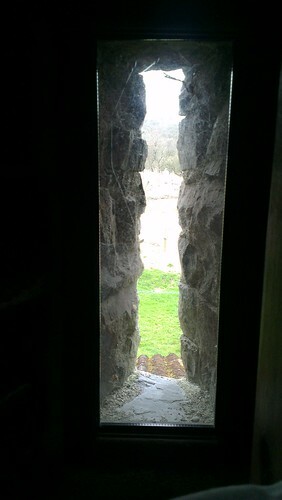 We saw a little lamb scramble back through the gate bars to its mother when we drove past it on the wrong side of the fence, and two pastel coloured Lambourghinis, and some runaway ponies by the side of the road, and an army truck smashed in a ditch. And there was a lot of cake, of course. As always. I hope we repeat it next year! I have grown accustomed to a knitting weekend away in the spring.